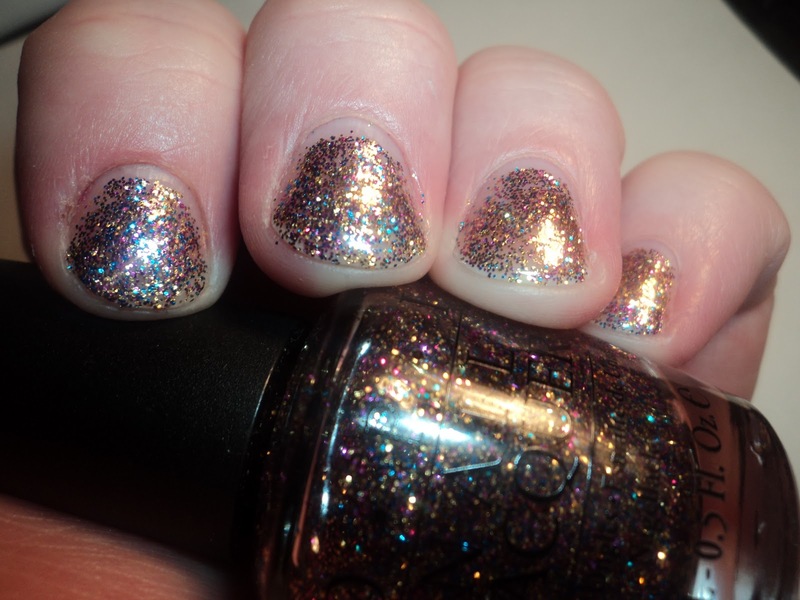 Here's the second part of the OPI Burlesque collection. The first half was a set of 6 shimmers/metallics and the second half is 6 glitters. 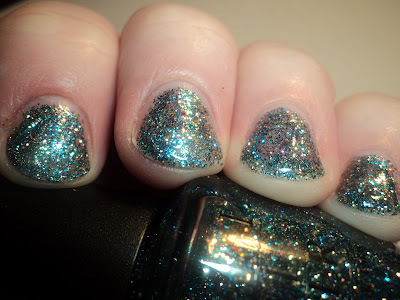 Now, these are no normal glitter topcoats. I'm talking full-on, glitter bombs, identical in formulation to the glitters from the Alice in Wonderland collection, Mad as a Hatter, and Absolutely Alice. Six glitters??? Be still my glitter loving heart. As soon as I heard about this collection, I couldn't wait to get my hands on them. And they didn't disappoint. Save for Sparkle-iscious, all of these glitters are pretty much variants on a theme. They each have the same core colors of purple, blue, gold, green and orange with different base colors. So in my descriptor for each color, I am simply going to list the base color and any colors that differ that particular polish from the rest of the Burlesque collection. 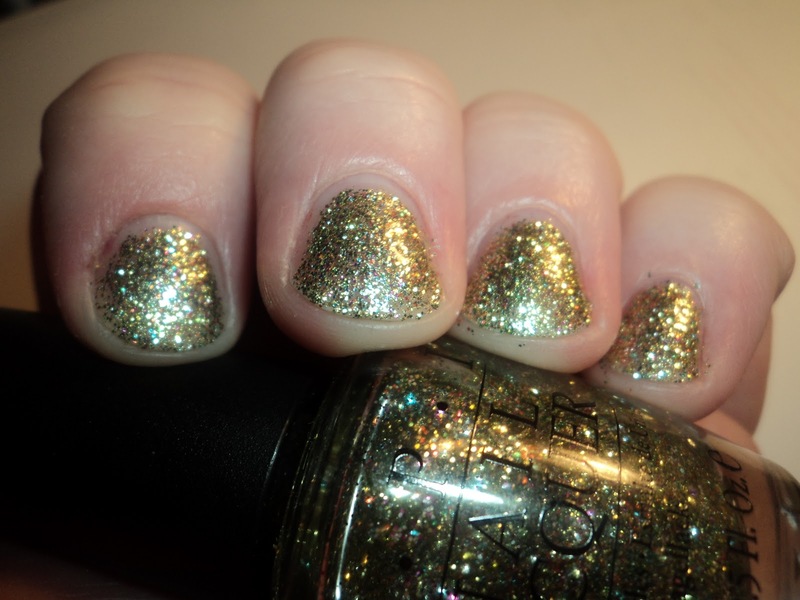 Also, I used anywhere from 3-4 coats in each picture, simply depending on how the glitter dispersed on the nail. Bring on the Bling - Gold. In this one the core glitter colors look like gems encrusted in a golden setting. The gold is a tad on the paler side, so it makes the core colors look somewhat pastel. This one would look great with a gold as a base, like Rising Star from this same collection. Extra-va-vagnaza - Pumpkin orange. Because orange and blue are opposites on the color wheel, the core blue in this one really pops. I didn't think I would really like this one, yet when I put in on the nail, I fell in love. The combination of the spicy, pumpkin-y orange and the vibrant light blue is awesome. The other core colors are certainly still there, but they take a back seat in this one. The counterpart to this one in the shimmers half is Take the Stage, and Extra-va-vaganza would look awesome layered with it. Glow up Already - Pale golden green. This one was rumored to be dupey of RBL Locavore. As I posted the other day, they aren't dupes, but if you are desperate for Locavore, Glow Up Already may be a good substitute until you are able to get your hands on the real thing. This one is similar to Bring on the Bling in that all the core colors seem to work harmoniously with the base color. There's not one that sticks out, but they all work well together. Show It & Glow It - Magenta purple. 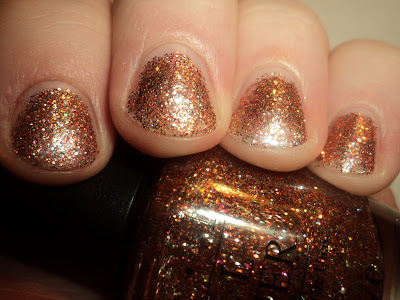 This one would be the most similar to RBL Frugalista (if you are trying to kill some lemmings), though the base color on this one is much brighter, plus there is the addition of the other core glitter colors. Also in this one, is a silver glitter that I'm not really seeing in the other colors. It may be there, I'm just not able to pick it out. As for a complimentary color in the other half of the collection, Show It & Glow It would look great with both Let Me Entertain You and Tease-Y Does it. Simmer & Shimmer - Turquoise Blue. I thought this one would be like OPI Reflecting Pool (a UK exclusive that I will probably never get my hands on), but it looks like Zoya Crystal has that covered. It's also not a dupe for OPI Absolutely Alice (sadly, not even close). The blue in this one is very serene. The pink in this one is the stand out color. Sparkle-iscious - Bright gold, blue, and magenta. Like I mentioned above, this one does not have the same core colors as the 5 others in this collection. Rather, this one is 3 colors... a bright gold, a piercing bright blue, and a magenta purple. If you were looking for a RBL equivalent, this one would be closest to Look Rich, Be Cheap, they really aren't that similar aside from the gold and purple glitter in each. 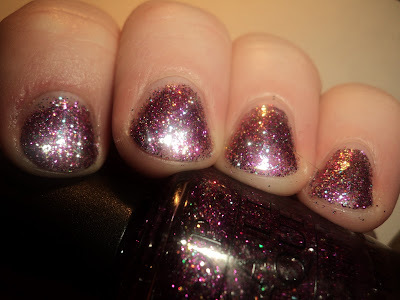 The golden base in Sparkle-iscious is definitely deeper, like an old gold, and the purple is much more red. Plus, this one has a blue that is not in Look Rich, Be Cheap. Okay, so I am a sucker for a good glitter-bomb and these really fit the bill. I kinda wish that rather than using the same core colors for 5 of the polishes, they'd been a little more original. If I had to pick favorites, I'd say Extra-va-vaganza, Bring on the Bling, and Sparkle-iscious, though they are all great for the glitter lover. Like with all glitters, removal is a pain, but that's standard for this finish. Burlesque is available at salons, brick and mortar beauty supply stores and online e-tailers. OPI retails for $8.50 a bottle. I love these! I have them all except Bring on the Bling. I love the sparkle-iscious one the most!